The jejunum (/dʒɪˈdʒuːnəm/) is the second part of the small intestine in humans and most higher vertebrates, including mammals, reptiles, and birds. 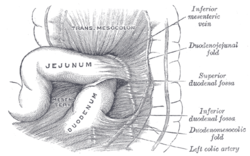 The jejunum lies between the duodenum and the ileum and is considered to start at the suspensory muscle of the duodenum, a location called the duodenojejunal flexure. The division between the jejunum and ileum is not anatomically distinct. In adult humans, the small intestine is usually 6-7m long, about two-fifths of which (2.5 m) is the jejunum. The interior surface of the jejunum— which is exposed to ingested food— is covered in finger–like projections of mucosa, called villi, which increase the surface area of tissue available to absorb nutrients from ingested foodstuffs. The epithelial cells which line these villi have microvilli. The transport of nutrients across epithelial cells through the jejunum and ileum includes the passive transport of sugar fructose and the active transport of amino acids, small peptides, vitamins, and most glucose. The villi in the jejunum are much longer than in the duodenum or ileum. The pH in the jejunum is usually between 7 and 9 (neutral or slightly alkaline). The jejunum and the ileum are suspended by mesentery which gives the bowel great mobility within the abdomen. It also contains circular and longitudinal smooth muscle which helps to move food along by a process known as peristalsis. If the jejunum is impacted by blunt force the emesis reflex (vomiting) will be initiated. 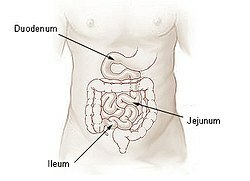 The jejunum contains very few Brunner's glands (found in the duodenum) or Peyer's patches (found in the ileum). However, there are a few jejunal lymph nodes suspended in its mesentery. The jejunum has many large circular folds in its submucosa called plicae circulares that which increase the surface area for nutrient absorption. The plicae circulares are the best developed in the jejunum. The jejunum has less fat inside its mesentery than the ileum. The jejunum is typically of larger diameter than the ileum. The villi of the jejunum look like long, finger-like projections, and are a histologically identifiable structure. While the length of the entire intestinal tract contains lymphoid tissue, only the ileum has abundant Peyer's patches, which are unencapsulated lymphoid nodules that contain large numbers of lymphocytes and immune cells, like microfold cells. The lining of the jejunum is specialized for the absorption, by enterocytes, of small nutrient particles which have been previously digested by enzymes in the duodenum. Once absorbed, nutrients (with the exception of fat, which goes to the lymph) pass from the enterocytes into the enterohepatic circulation and enter the liver via the hepatic portal vein, where the blood is processed. The jejunum is involved in magnesium absorption. In fish, the divisions of the small intestine are not as clear and the terms middle intestine or mid-gut may be used instead of jejunum. Jejunum is derived from the Latin word jējūnus, meaning "fasting." It was so called because this part of the small intestine was frequently found to be void of food following death, due to its intensive peristaltic activity relative to the duodenum and ileum. The Early Modern English adjective jejune is derived from this word. ^ Entry "jejunum" in Merriam-Webster Online Dictionary. ^ a b Drake, Richard L.; Vogl, Wayne; Tibbitts, Adam W.M. Mitchell; illustrations by Richard; Richardson, Paul (2005). Gray's anatomy for students. Philadelphia: Elsevier/Churchill Livingstone. pp. 273–275. ISBN 978-0-8089-2306-0. ^ Deakin, Barbara Young ... [et al. ]; drawings by Philip J. (2006). Wheater's functional histology : a text and colour atlas (5th ed.). [Edinburgh? ]: Churchill Livingstone/Elsevier. p. 263,. ISBN 978-0-443-068-508. ^ CRANE, RK (Oct 1960). "Intestinal absorption of sugars". Physiological Reviews. 40: 789–825. PMID 13696269. ^ Guillaume, Jean; Praxis Publishing; Sadasivam Kaushik; Pierre Bergot; Robert Metailler (2001). Nutrition and Feeding of Fish and Crustaceans. Springer. p. 31. ISBN 9781852332419. Retrieved 2009-01-09. ^ Harper, Douglas. "jejunum". Etymology Online. Retrieved 15 November 2014. ^ "Oxford English Dictionary: jejune, adj". Anatomy photo:37:11-0100 at the SUNY Downstate Medical Center – "Abdominal Cavity: The Jejunum and the Ileum"